The 2017 Subaru Impreza is officially the first Impreza model to be built in the U.S. All new this year, the car was built using the new Subaru Global Platform, which makes the car longer and wider, providing passengers with extra legroom. In addition to the new platform, the Impreza gets new exterior styling, featuring hawk-eye headlights, a hexagonal grille, a sculpted body and prominent wheel arches that give off an athletic look. The car's interior also sports a new outward-flow design and a variety of excellent technologies, which you can read about in our 2017 Subaru Impreza review below. Coming into the new year, the 2017 Subaru Impreza in Springfield is offered as a sedan and 5-door hatchback. It's also available in four trim levels: base, Premium, Sport and Limited. 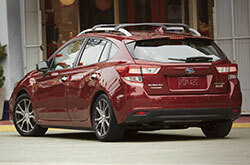 The Sport trim is the latest model to join the lineup, offering great features that standout from the rest. 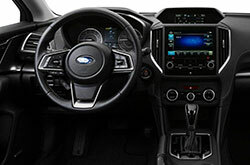 On the Sport, buyers will find LED daytime running lamps, a black-finish grille, black upholster with red stitching, a Subaru STARLINK 8-inch touchscreen multimedia system, keyless entry and a harman/kardon audio system. Other trims in the lineup feature everything from Android Auto and Apple CarPlay integration, heated front seats and a power moonroof to automatic climate control, leather interior and Steering Responsive Headlights. 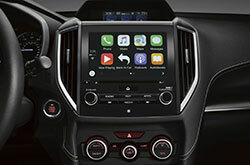 Different versions of Subaru STARLINK are also available, offering Bluetooth, iPod control and navigation. Producing 152 horsepower, a 2.0L four-cylinder Boxer engine is outfitted on the new 2017 Subaru Impreza in Springfield. The highest trims in the Impreza lineup pair the engine with steering wheel paddle shifters and a seven-speed manual mode function, which allows the driver to control the transmission. Praised in several 2017 Subaru Impreza reviews, this is a notable feature most Subaru fans will appreciate. Named a Top Safety Pick+ when equipped with EyeSight Driver Assist Technology, the 2017 Subaru Impreza is a prime choice for buyers in the market for a safe family vehicle. The EyeSight system comes with a host of advanced safety technologies, including Rear Cross Traffic Alert, Blind Spot Detection, Lane Departure and Sway Warning, Automatic Pre-Collision Braking and High Beam Assist. The esteemed 2017 Subaru Impreza should be on your shopping list, especially if you've been in the market for the 2017 Ford Focus, Mazda3, Volkswagen Jetta, Chevrolet Cruze and the Honda Civic near Springfield. You may find that it is a terrific match for you, with its winning exterior design and deviceful in-car technologies. 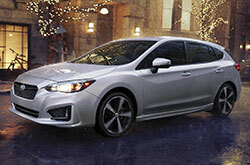 Find out if the 2017 Subaru Impreza is ideal for you using our evaluation and other research tools, then browse up-to-the-minute financing and leasing incentives! 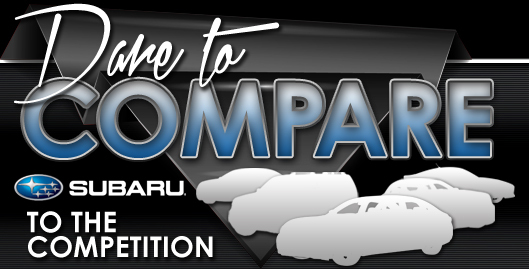 As your hometown Subaru vehicle retailer, we're the destination to find offers on the Subaru Impreza, as well as other new and CPO vehicles. To help you make a sound decision when searching for your next car, we've included this 2017 Subaru Impreza review right on our site, making it easy and fast to find the facts and figures you need. 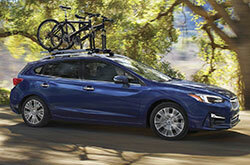 Get prepped to be amazed with the stately Subaru Impreza for sale at Reliable Subaru in Springfield, MO. Schedule an appointment for a test drive. Also take a minute to watch our video clip, which presents the car's modern equipment!